USA Today said Fairway Solitaire is "so engrossing you can’t simply put it down." Kotaku called it "damn good." And for a limited time, you can get the paid version for free. 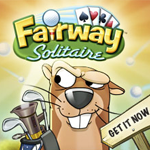 Download Fairway Solitaire today.